/Reseller /How to publish manually iOS apps? This article is an overview of how to publish an iOS app. An iOS publication under one developer account needs 4 files, one file that will sign the certificates and 3 certificates. The file that will sign the certificates and one of the 3 certificates are used for all apps published under one developer account, and the two other certificates must be created each time you will publish a new app. These 2 files will be created once (the first time you are going to publish under this developer account). It is the CertSigningRequest (CSR) and the iOS distribution certificate (ios_distribution). The CSR is created from your computer (must be a Mac) from the keychain access, and the ios_distribution is created from the Member Center at developer.apple.com. You will use this CSR and ios_distribution certificate for all the apps that you will publish for John Doe, if there are several apps to publish under this account. You create once and you use them each time you publish an app for John Doe under his account. For your information, the Keychain Access to create the CSR is in your Mac in Applications > Utilities. You will need some screenshots to fill out the app sheet on iTunes. You will be able to make them with Xcode and especially with the iOS Simulator delivered with Xcode. 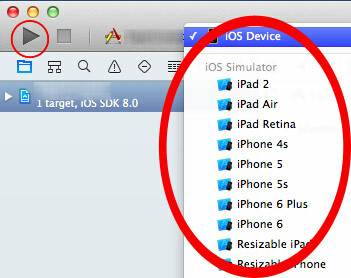 Open the Xcode project that is in the ios_source folder , then choose the target, iPhone 4s for instance, and click on the Play button.